Custom Fireplaces | Flue Tech Inc.
Let our team help you design the fireplace you and your family will enjoy for years to come. 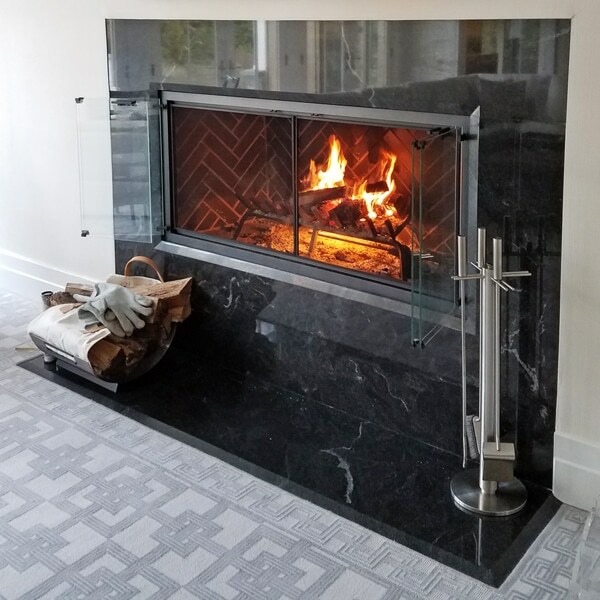 Flue Tech’s experienced fireplace designers and masons can build a custom fireplace for almost any installation. We offer a wide variety of firebrick colors and firebox designs, including herringbone. We use Superior Clay firebricks to ensure that you will get a fireplace you and your family will enjoy for years to come. Find out how easily we can make your fireplace wishes come true. To get a free estimate on your project, contact us today or give us a call at 866-Flue-Tech. Bellfires models are complete modular fireplaces. They may be installed with close clearances to combustibles and incorporate firebox and smoke chamber all within a sheet metal enclosure. Bellfires fireplaces include high temperature insulation that keeps all outer surfaces at safe temperatures. Direct vent gas fireplaces are an efficient and versatile fireplace option. Unlike traditional fireplaces, they do not require a masonry chimney. Instead they use outdoor air for combustion and venting. They can be vented horizontally or vertically through a wall or roof. Direct vent gas fireplaces are easier to install than traditional fireplaces and can be placed nearly anywhere. Their glass doors prevent heat loss, making them a very efficient option. Customize your fireplace with stylish and energy efficient screens and doors. We can custom make multiple styles and types of glass doors and screens. We work with industry-leading manufacturers who have the resources to custom make glass doors or screens of any style. Zero clearance fireplaces are an ideal choice for installation in close quarters or next to combustible materials. They can be safely installed with wooden framing directly against the metal stand-offs on the fireplace’s cabinet. Backed up to a combustible wall or inserted into an opening cut into the wall and then framed in with standard wood framing, a zero clearance fireplace is an ideal way to add a fireplace to your construction or remodel plans without the expense and hassle of building a masonry fireplace structure. Zero clearance fireplace are pre fabricated fireplaces for new construction or renovation. These types of fireplaces can be gas, wood or pellet.